The Young and working population of India is the biggest positive factor for India and its growth in coming years – We have written about it many times earlier on this blog, and another survey reiterates this fact again with some Interesting numbers ! Just to show you the amount of difference between other developing Countries and India – Have a look at this graph. Between 2010-2030, India will add 241 Million people in working-age population (and that means the children who are currently in our education system), Brazil will add around 18 million, while China will add a meager 10 million people during the same time. So even with all the drawbacks that India has, this particular Indian aspect is going to prove pivotal in making India the world leader in coming years. 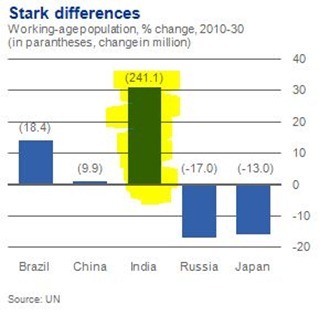 The demographic developments in the BRICs over the next 10, 20, 30 years will vary greatly. This will impact not only economic growth prospects, but also savings and investment behavior and potentially – if somewhat difficult to quantify – financial market growth prospects. India is demographically in a substantially more favorable position than China and Russia. Brazil’s “demographic window” (defined here, non-technically, as a falling dependency ratio) will close around 2020-25, while in China and Russia it is closing right now. India, by contrast, will enjoy a very favorable demographic momentum for another three decades. So even though in current scenario, India may not exactly be mentioned in the same breath as US, UK and China, the picture in next couple of decades will be quite different. Even from our Financial Markets point of view – If you really have a long-long term view, there is not better place to invest in stock Markets than in India ! What are your views – Do you see things differently? "India’s Young Population: Its biggest asset ! ", 5 out of 5 based on 1 ratings. Holi Hai !!! Wishing you a safe, colorful and joyous Holi ! 70 Years of Independence; Looking Back Towards The Future! Excellent indeed ! Keep it up young man ! The biggest challenge that stands before us is to devise strategy to translate this immense human resource into employable asset. This need becomes more imminent in the light of the fact that nearly 89.7% population is employed in skill based jobs whereas only 7 % of them have undergone through any kind of formal job oriented training. thus , if not managed, what seems to be our demographic dividend can potentially turn out to be burden.- abhishek dubey. For INDIA to be global power, India should start respecting poor people esp farmers else India will develop social unrest. Hi, i agree on the content part, but deviate on the analytical grounds. There are 2 things, which are essential for it. 1. quality of population generated is more important than quantity. going by the pareto’s principle or 80-20 rule. 2. maintaining that limited high quality talent pool in india. how can one be sure that what grows in india, remains in india. eg. in silicon valley, there wont be a greater population boom than india, but does that mean the quality of population boom in silicon valley too wouldnt be higher than india. it pulls the best lot of india too. so basically, the point is, how much is the creamy lot and, how much will india be able to retain. india still houses 17.5% population of the world on 2.5% land. by this figure itself, one can conclude india to be on top, but this isnt the case. so i think some more data is required to absolutely conclude on the point that you are trying to conclude. A nation is made great by its people and people in turn become its important citizens…In India according to suresh Tendulkar report, poverty is around 37% and this 37% to which India feeds thruogh various its programmes. So this 37% is contributing least to the economic growth of India and it is like debt of the country which it has to bear it..
Only healthy, educated and prosperous people make their nation great by contributing in its growth. India has taken many initiatives for this like RTE, ITI institutions under PPP mode, RMSA etc. …and these schemes of poverty alleviation and education, has shown good results in a decade..
India’s young population is a big asset for the country.Young generation will be able to give new ideas to increase the production and simultaneously the national income. yes,high population is the major cause for being a developing country but we should take this disadvantage as an opportunity by educating more of people.Ofcourse there are lack of employment opportunities available but we can’nt deny this fact that there are lack of skilled labour also. Population has never been an asset to anyone.Infact it the only reason why we are still a developing country inspite of being one of the largest economies in the world.How in the world we are ever going to find jobs for 241 million people.We have doubled the economy in the last 10 years with no appreciable increase in the number of jobs.So this economic growth has not exactly translated into job growth.Bottom line: We dont need young people for economic growth.Most probably all the frustrated Indian youth will join the Maoists and cause further agony to the Indian state.Being a 23 year old i have a scary future. Your view is fine enough but provided guided and educated them well to take crucial part of development. Every generation is different from each other and having their own individuality. Keeping all of them on single motive is important and difficult too. The data is correct. India therefore, in theory, stands to reap the benefits of its ‘demographic dividend’ over the next 3-4 decades. However, this assumes that the ‘working age population’ will be skilled and educated enough to contribute to the GDP – and therein lies the trap. If we do not invest in Education today (and that too higher education), the children studying in today’s and tomorrow’s schools will not be able to significantly contribute. We will see a couple of ‘lost decades’. In fact, I think that is the opportunity that beholds the education companies like Educomp, Everonn, Edserv etc., which are participating in PPP program and taking their models and education content to rural places. The point that needs to be also noted is that the skills the youth will need 2 or 3 decades from now are not necessarily what are being taught in classrooms today. So we need visionaries like Kapil Sibal and Shantanu Prakash (of Educomp) who look into the future and are looking to provide those skill sets. Parents too have to do the same thing and teach the children the skill sets they would serve them well when they join the work force or take up entrepreneurial routes. More career options will be available to our children than we ever imagined. The economies of USA, Japan, Taiwan or Singapore reap the benefits of what the baby-boomber generation contributed during their prime (for the last few decades). The government’s investments in R&D, technology, defence capabilities, electronics, bio-technology etc., stand them in good stead despite the massive shift in economic power from the west to the east. Despite China being the manufacturing plant of the world, the techniology for the circuit boards they are fitting onto the TV screen or computers come from Japan or Taiwan, and so these countries get paid for the IP (may be 40% of the cost) while China assembles the parts and gets a small sum (may be 10-15%). So I think, we as a country need to determine our goal for the next 2 or 3 decades and impart such skills to our future generations.